10% off all orders of 10 pages or more! In this critique, Walker’s (2006) article “Color of bile vomiting in intestinal obstruction in the newborn: Questionnaire study” that was published in BMJ journal is critically analyzed. The critical Analysis explores the article’s hypotheses, subjects chosen, sampling method, data collection method, statistical analysis, study design and finally the discussion. Comments: Purpose of the study was in line with the problem. Purpose of the study was also limited to researchers’ capabilities and resources available for the study. Findings from the study could be used in hypotheses testing on perceptions on the color in bilious vomit. This was a qualitative study that involved case reports design during the research. There was no involvement of controls during the study. Questionnaire was the only tool for data collection used during the study. These questionnaires basically comprised of 8 colors, ranging from yellow through to dark green, that were numbered and from which respondents were to choose from. Comments: There was no pilot study conducted. Testing of instruments to be used in data collection was not performed, something that resulted in some questionnaires not being returned from some general practitioners. General practitioners, nurses, midwives and mothers of babies and infants were purposively selected for the study due their experience with newborns. Convenience sampling technique was then used in the distribution of questionnaires among individuals in the different sample groups selected. Individuals taking part in the study were therefore chosen on their availability during the study. Comments: There is no clear sampling technique illustrated in sample selection. Information about how they arrived at their sample sizes is also missing. Comments: Selection of respondents is not provided. We only see questionnaires being administered. Information about the subject as a representation of the bigger community is also missing. Questionnaires were administered to the respondents. 80 questionnaires were given to the general practitioners, 48 to midwives, 29 to nurses and 48 to mothers. Questionnaires for the general practitioners clinics were delivered by hand while in stamped envelopes with addresses. Mothers, nurses and postnatal midwives received their letters through hand. A large envelope was however left behind for collection to ensure anonymity. Respondents were expected to choose a color that represented a newborn’s vomit with bile. Respondents were allowed to choose more than one color for this. The next task involved respondents choosing only one color matching that of bile. Comments: The study did maintain consistency in the method of study used, for instance all participants were given a large envelope for collecting questionnaires except for those from general practitioners. This resulted into 42 % of general practitioners failing to return their questionnaires. Questions on the questionnaires were limited, there was need to include questions on any history of bilious vomiting and what solution was provided. Responses obtained from returned questionnaires were grouped into two categories of green and yellow. Percentages of responses about the color of a newborn’s vomit with bile and those for responses on a color similar to bile were calculated. Information obtained was then tabulated. Percentage for the number of questionnaires returned from the different groups of participants was also obtained. Comment: Analysis in percentage form is given for each finding in the study, however descriptive statistics was missing as it was the case with inferential statistics. Hypothesis testing was not done after analysis of findings. Relationship between the anatomy of the small intestine at the duodenum and bile duct is well illustrated in the discussion. The mechanism for the presence of bile in the vomit is attributed to the obstruction below the level of bile duct into the duodenum. Conditions associated with intestinal obstruction are also provided. Conclusion on the findings of the study is also provided. General practitioners and nurses did not match the expectation of the researchers during the study. A significant number showed their uncertainty when it came to matters of the best color for bilious vomit. A summary on already known information about bilious vomit and additional information provided by the study is also provided. Recommendations were also included in the discussion; it was recommended that yellow vomitus should not be ruled out as an indicator of intestinal obstruction and a study including newborns found to have had yellow vomitus should be conducted. Comments: The discussion was based on findings and was stated logically. Theoretical information about bilious vomiting was also provided. Questionnaire study. Bmj, 332(7554), 1363-0. Comcast XFINITY is the largest cable provider globally. It brings together the best media and technology by creating the world’s best online experiences. It is located in Center City in the United States. According to the company website, it operates in 39 states and covers over 113 million people. For decades, the internet of most enterprises, if not all, have been based on wired connections. To solve this, the company delivers the simplest, most complete and fastest way to access the best entertainment experience. XFINITY Internet provides the most reliable and fastest in-home Wi-Fi for all devices and rooms at all times (Nadler, 1992, p 45). This is the best way to connect with friends and family members through XFINITY Voice which provides unlimited nationwide texting, enhanced calling features and reliable home phone service with the best call clarity. Comcast XFINITY offices are in the 19th tallest structure in the United States. Moreover, the house features retail and cafeteria space designed to be environmentally friendly. The innovation, along with development center, was intended to be a collaboration as well as development space to build products that change on how people connect to internet, entertainment and information by bringing together the best in media and technology. Comcast XFINITY creates a space that carries projects for themes of open office space along with interactive, collaborative zones while creating a unique space for the development teams. Each floor in the Comcast XFINITY offices has a signature color and unique design. The angular soffit hangs an intimate and residential experience and a variety of seating bar height tables along with island stools provide places for people to work as well as grab a cup of coffee. On the other hand, Fios is a new fiber optics communication network company from Verizon. Verizon has been rolling some services such as Bundled pricing, television, internet and voice services. Fios has undergone the largest infrastructure projects globally to build a premier fiber network. The company has made a 21st Century network to keep up with the latest technology. Experts across the globe have the same opinion that Verizon Fios network know-how is the Gold Set for Internet as well as amusement delivery. Fios offers fast upload and download speeds which are available to more than 15 million homes in the Northeast and Mid-Atlantic U.S. The company is expanding its base allowing customers to access widgets for localized content. Verizon services are delivered using passive optical network technology. The fiber optic technology which the company uses has an inherently higher capacity. Verizon gives customers the freedom to cancel the services it offers at any time. This is one of the biggest advantages that give Verizon Company a chance to access to services. Services and technology have given this company a boost for fighting market share and have negotiating power. Substantially, Verizon has better terms and more attractive deals since new customers are driven to search for more cost-effective home service options to make the switch from one of the bigger cable companies. The company has offices which are facing windows with harbor views. The firm has a newly renovated reception area, fully furnished and equipped office space. Some of the facilities within the company include shared conference room with video conferencing, shared kitchen, shared receptionist, telephone and the internet, utilities and access to state of the art printing, faxing and copying machine. Therefore, this study explores Comcast XFINITY and Verizon Fios the major internet service providers based on their architecture, inner space, artifacts, floors, offices and meeting places within their premises. The architecture and artifacts of Comcast XFINITY Company comprise of the process as well as the product of designing, planning along with constructing buildings and other physical structures (Null, & Lobur, 2012, p 67). Historically, architecture requires creative coordination of material and technology. The structure of this company stimulates as well as influences social life which in other hand promoting social development. Rationalism, phenomenology, and structuralism are some of the philosophies that influence the modern architects and their approach to building design. This aspect of architecture and artifacts are entirely the subject of functionality. On the other hand, the inner space, architecture, and artifacts of Verizon Fios are planned with a range of shape alongside color varying from the open white space of the upper administrative center to the multicolored walls of the meeting room. The structure of Verizon Company consists of a central material with metallic framed floors. The rest of the room within the company is used for content and training teams as well as shopper service. Additionally, the company contains two works of installation art designed by Nile Creative Group and Jonathon Borofsky’s Civilization in Motion. Therefore, the rise of new materials and technology enables both companies to concentrate on aesthetics and humanist aspects. This study explores Comcast XFINITY and Verizon Fios companies based on their architecture, inner space, and artifacts. Further, the study accesses the available documents such as the books and their titles, banners on the walls, websites and the implicit themes within the organization. From the review, Senses are physiological abilities of organisms that make available data for sensitivity. Human beings have a huge number of senses but from the case study the senses used include sight, hearing, and touch. Companies involved in the creation of multimedia content play a vital role in capturing multimedia data and software tools. Some companies fully utilize public Internet and public cloud infrastructure (Govindarajalu, 2014, p 44). The growing ubiquity of cloud computing and the internet services have a significant impact on businesses that provide media related services. It is evident that there are several variations of devices that can be used in learning systems and can be successfully applied to teach theoretical knowledge presented in the structured multimedia content. The artifacts of companies can be read out through offices of most successful persons in the organization. However, essentially, the offices and meeting places of these companies are full of artifacts and real clues about what the team values. Ideally, every company has stories based on the founders, memorable photos of employees and other precious subjects. The author of this article examines the information that an organization values. First, companies have only two functions which are marketing and innovation. According to the author of this article, innovation helps the company to generate new products and business model. On the other hand, marketing lets the world to know about those innovations. Creating a creative culture help the organization to execute on marketing and innovation properly. Understanding the dynamics of culture typically enable the company to learn all opportunities by allowing limited risk taking. This article takes advantage of the recent developments to enforce standardization across service implementations. The author of the article develops as well as demonstrates a sophisticated content management services within organizations. Developing and supporting collaborative workflows help companies to manage complex multimedia context. Moreover, Fiber is one of the few technologies that can legitimately provide customers with better and faster service offering so that to accommodate the growing demands. Bandwidth is the biggest advantage fiber holds. In the past few decades, the rapid evolution of technologies surrounding telecommunications and computing has reached a threshold of providing returns of continued investments. Communication infrastructure is one of the new value simple concepts leveraged through technological innovation. Further, this article explores how new technologies in most companies have been able to provide a breakthrough in transmission technology over copper lines as well as upgrading the existing copper lines. For the business to be efficient concerning providing internet services, it requires significantly greater densities of antennas and placing powerful devices which must accept as well as cope with all existing along with potential future interference from other users (Lerner, 2012, p 34). The company should be able to apply a technique that ensures sufficient data bandwidth. Given that internet services provided by most companies are relatively high cost and low capacity, the services are best suited for scenarios in which other connectivity options are unavailable. (i) What cues within the organizations that support the implicit themes? (ii) What are the values expressed in the physical location of these teams based on floors, offices and meeting places? (iii) How the available documents in these companies furbished based on their architecture, inner space and artifacts? Like any other study, research methodology collection is a significant criterion here. Suitable research methodology helps out to present the study work in a comprehensive way. This section of the investigation explains the move and endeavor in research work to collect helpful information about Comcast XFINITY and Verizon Fios companies based on the available documents such inner space, architecture and artifacts that are expressed in the physical locations. The organizations had implicit themes which helped to collect every relevant piece of data and to validate the validity of the study topic. The most important objective of this business study is to investigate about the possible perception observed within the premises of the companies and identify the architecture, inner space and artifacts of the firms. This study strategy ideally utilized non-experimental method of exploration, which for the most part focuses on the logical examination of known information as well as facts in a methodical way. A sample size of 50 employees from each company will be selected to give precise information about the artifacts, inner space, architecture and meeting places of Comcast XFINITY and Verizon Fios. Comcast XFINITY and Verizon Fios companies operate to facilitate the internet and deliver a range of services. As rapid innovation in Internet-related services continues, the existence of these services provides the consumer with some benefits. However, the underlying technical methods used by both companies are significantly different with various benefits along with limitations (Costas & Grey, 2016, p 56). The alternatives of these methods provide competition and consumer choice in the market. 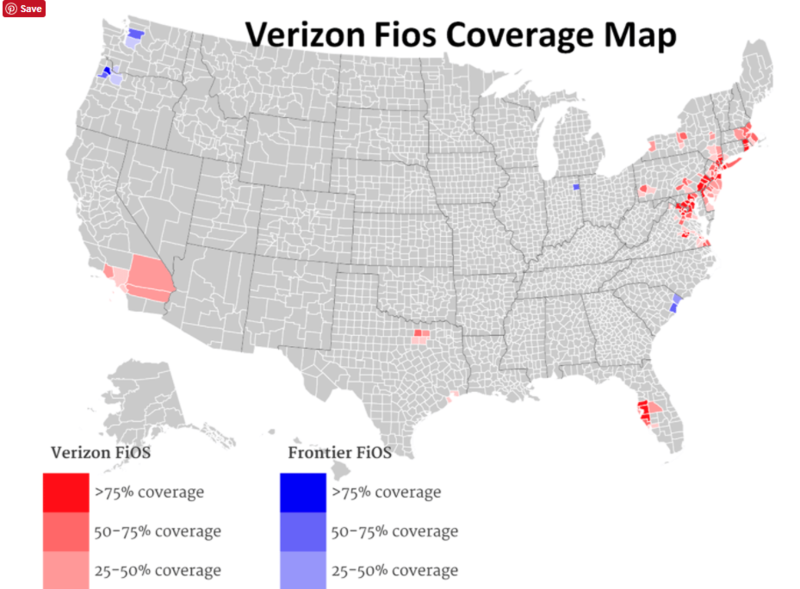 Evidently, both Comcast XFINITY and Verizon Fios companies support innovation and make higher assurance of delivery of quality services by offering different pricing packages. Therefore, different technologies combined with other improvements exercised by both companies create multiple services to customers in the market. Organizations. New York, NY: John Wiley & Sons. Costas & Grey, (2016). Secrecy at work: The hidden architecture of organizational life. applications. New Delhi: Tata McGraw-Hill. networks, and organizations. Malden, MA: Blackwell Pub. Lerner, (2012). The architecture of innovation: The economics of creative organizations. Null, & Lobur, (2012). The essentials of computer organization and architecture. Sudbury, Mass. and management in modern organizations. Blueston, G. Novels into film. Baltimore: Johns Hopkins University Press, 2003. Cartmall, D., Whelehan, I. Adaptations: From text to screen, Screen to text. New York: Routledge, 1999. Dramatica. Harold and Maude: Comprehensive Storyform . 2017. 8 February 2017. Harold and Maude. By Colinn Higgins. Dir. Hal Ashby. Perf. Bud Cort, Vivian Pickles Ruth Gordon. 1971. VHS, DVD. Post-traumatic stress disorder is a condition that develops in individuals that have been subjected to scary, shocking, life-threatening occurrences/events or who have witnessed violent actions that make them afraid or stressful when reminded of the same National Institute of Mental Health, 2013). Adolescents and children also experience the same when exposed to such occurrences in their life but with slight differences to those of adults. As per statistics, estimates show that about 5% of adolescents meet criteria for post-traumatic stress disorder. Prevalence is lower for males than females at 8% and 2.3%, respectively (Hamblen & Barnett, 2016). However, there are no significant studies on the prevalence of this condition in younger children. The following paper, therefore, discusses post-traumatic stress disorder in children and adolescent regarding events, symptoms, interventions and guidance to parents looking after children with the condition. Exposure therapy is one of the many interventions used in treating post-traumatic stress disorder among victims of sexual abuse. Given the fact that individuals with treating post-traumatic stress disorder always try to avoid reminders of the trauma they underwent, exposure therapy is the best intervention for them. It helps in reducing irrational feelings held by a person towards the given situation by safely and strategically exposing them to various aspects of the fear. This could, therefore, be used for children or adolescents who fear to be alone or in dark places since it reminds them of the bad experience they might have experienced in such places (Good Therapy, 2015). Hamblen, J., & Barnett, E. (2016, February 23). PTSD in children and adolescents. US Department of Veteran Affairs. When Charlotte Perkins Gilman wrote “The Yellow Wallpaper” in 1892 the women’s suffrage movement was just beginning to gain momentum (VCU Libraries, 1995). “The Yellow Wallpaper” can easily be interpreted as a critique of how women of a certain social status were treated and regarded by men in their society. These attitudes, and their effect, can be seen as the primary theme of the story. Perkins Gilman uses a variety of literary strategies to develop her theme of madness as a symptom of patriarchal control, including, most notably, setting, symbolism, and figurative language. In a literary context, setting refers to where the story takes place. The setting of “The Yellow Wallpaper” is very important, as the entire story takes place in just one room. Although the narrator describes the room itself in fairly pleasant terms as being “big, airy” and having “sunshine galore” (Gilman, 2009), it resembles a prison. The barred windows, rings in the walls, and giant bed nailed to the floor all create the impression that the narrator is being held captive against her will, which, in a way, she is. The most important element of setting to consider is, of course, the yellow wallpaper from which the story takes its name. The figurative language used to describe the wallpaper in “The Yellow Wallpaper” helps to establish it as a symbol of oppression. Gilman uses these and other literary strategies to create a story that clearly conveys the obstacles the narrator, and by extension any woman in her society, is up against when attempting to escape the binds of social expectations and the patriarchy. Gilman, Charlotte Perkins (2009). “The Yellow Wallpaper” (1892). The Yellow Wallpaper and Selected Writings. London, UK: Hachette Digital. VCU Libraries (1995). Woman Suffrage: History and Timeline. In The Social Welfare History Project. For efficient service delivery, health care facilities have a duty of conducting a cause analysis (RCA) to respond to any situation at hand. Through such an approach to nursing, practitioners can perform a failure mode and dynamic analysis (FMEA) to help in reducing the likelihood of a process failing. As a method, RCA helps professionals in identifying the cause of problems or faults in a system. According to Davis et al. (2008), practitioners consider a factor as a root-cause when the removal of a concern impedes the final undesirable circumstances from recurring. Thus, through the elimination of a causal factor, various elements can benefit the outcome of a process. It’s thus hard to develop the recurrence of such a situation with certainty. The case scenario in task 2 develops a classic case of failure demonstrated by the affected teams. There were many causative factors to blame in this scenario. When the patient was brought in, he was experiencing a 10/10 pain as a result of the fall. Physical tests were undertaken in the Triage, which included B.P, HR., R, and T. Everything seemed perfect except for the breath rate at 32 per minute. Respiratory therapy is available but it is not readily availed to Mr B. Medication is provided to regulate the same atorvastatin and oxycodone all in good will, but unfortunately, oxycodone worsens the breathe rate of the patient as well as inhibits the required sedation. This is one of the prevailing causal factors that probably led to the unfortunate death because this aspect was mostly ignored by nurse J and the physician. After the triage, he was moved to the emergency department. The weight of the patient impairs the sedation process. During a previous visit to the doctor, Mr B is found to have elevated lipids and cholesterol – a case that is exhibited by the swelling of his leg. This is another causative factor. Several factors led to the death of the patient, these includes: poor staffing, high patient number in the facility, the patient left unmonitored, alarms dismissal by staff, and inadequate supplemental oxygen initiation before the procedure (Davis et al., 2008). Notably, at the time the patient was pulseless, the attendants initiated no CPR until the arrival of the code team, thus leading to delayed critical interventions by the emergency staff. Besides, the staff never reviewed the patient’s’ medication history at the emergency room. As such, the team administered triple intravenous doses of valium and Dilaudid without considering adequate lapses in time. Broadly, the team failed to assess the patient’s sedation process. Furthermore, change theory as, Armitage and Hollingsworth (2010) note, is a general approach or notion to change, which a medical staff finds to be convenient in developing the distinct concepts for changes, which lead to an improvement (Davis et al., 2008). According to Armitage and Hollingsworth (2010), Lewin’s Model of Change entails three steps of initiating change to enhance care quality. Motivation or unfreezing is the first step, and it aims at promoting communication while empowering the staff to be open to various working models. Should we follow the credited failure mode and effects analysis (FMEA), the plan might face some failures for example, in the event the citizens fail to embrace the plan. Some of them have very tight schedules and cannot understand the importance of using the less time available in reading the number of calories in a sample fast food. However, to avoid such a scenario a simple chart, containing a list of common food staff and their calorie-numbers will be availed for each resident thus promoting the success of the aspect in the plan. Failure Mode Effect Analysis is a treasured tool or process, which is useful in reducing and eliminating defects. FMEA thus applies systematic methods in evaluating the processes for detecting where and how the process might fail while gauging the potential effect of the different types of failures. The tool then assists in identifying the segments of the process, which are in dire need of change (Davis et al., 2008). In the process, FMEA avails in-depth examination, thus outlining the steps followed and the diagnosis criteria. The FMEA requires a team to achieve the desired success. Success is defined as the coming to an “end” of the root causes related to the effect. Obviously that is a complex process that requires different sets of people. An example of these is the interdisciplinary team consisting of the supervisors and the physician. This is the team that works round the clock to come up with ideas and enhance them. A team like this one will be handling the staffing organization. It is required to come up with ideas of how to encourage the nurses to work under the ethics and principles that will be provided. A multidisciplinary team for this process would include a pathologist, clinical nurse specialist, lead lab technician, anesthesiologist, and obstetrician to form part of the Failure Mode Effect Analysis team. Gather a multidisciplinary team and assign them their specific roles. Make the team to collect and assess all the internal and external data as well as the scope of rehearsal and the clinical practice procedures as Board of Registered Nursing stipulates. Select a process to analyze: this would be the betterment of healthcare in our rural homes. Charter and select team facilitator and team members: as explained above the process requires distinct members. Describe the process: explain to the team members what the issue at hand is and most importantly, what is required of them. Be specific and clear. Identify what could go wrong during each step of the process: identify the shortcomings of the procedure. For example, the rural populace might not take lightly the thought of lifestyle change. Design and implement changes to reduce or prevent problems: the team will come up with ways of carrying out the procedure at the lowest cost and with the least time required. Measure the success of process changes: have a grading system for the process so that if it fails to work out, you can notice early and change. Application of the three steps of the FMEA (severity, occurrence, and detection) to the process improvement plan created in part B. The three steps of Failure Mode Effect Analysis are detection, severity, and occurrence. Detection considers the ease with which to visualize a concern. Severity denotes the condition of the matter while event signifies the likeliness of an anticipated manifestation. Each team member is then assigned a numeric value called Risk Priority Number (RPN) for the prospect of detection, occurrence, and severity (Cherry & Jacob, 2010). Each failure mode is then assigned a numerical value of between 1 and 10. According to Armitage and Hollingsworth (2010), this digital grading puts a figure on a possibility that a failure would not be detected, the probability that a failure would occur, and the prospect of the damage or harm the failure mode may cause. This is shown in the table below. I would test the intervention of the above process by analyzing how general it is. It should be applicable to many nurses – patient relationships in that, most of the cases of nurses doing a shoddy job are as a result of “forgotten” or rather ignored principles – a factor that needs continuous reminder. For this reason, I would apply the procedure in another case of associated with sentinel event. A nurse can exercise her duty of caring for patients by leading the patients into a healthy lifestyle. She could encourage them to live right, eat right and have frequent balanced exercises – a very important aspect in the health of a patient. Thus, a nurse’s role is to provide a holistic care and to ensure adjustment in the day-to-day work setting. According to Davis et al. (2008), nurses are vital in health care system since they are the first people to identify a crisis and call for medical attention. Thus, nurses should be unremittingly cultured on best evidence protocol. Systems must encourage their nurses to follow hospital rules and help in maintaining safer patient care in communities and hospice environments. Armitage, A, & Hollingsworth, N. (2010). A practical guide to failure mode and effects analysis in health care: making the most of the team and its meetings. Journal of Quality Patient Safety, 36(8), 351-8. Cherry, B., & Jacob, S. (2010). Contemporary nursing: Issues, trends, and management (5th Ed.). St. Louis, Mo: Mosby. Davis, S., Riley, W., Gurses, A., Miller, K., & Hansen, H. (2008). Failure modes and effects analysis based on in situ simulations: A methodology to improve understanding of risks and failures. Voting rights are fundamental rights to which everybody is entitled and the ability to vote marks democracy and ought to be upheld by all people. Voting is a mark one’s commitment towards their country and heritage, and regardless, the majority of States in America practice felony disenfranchisement. Felony disenfranchisement refers to the revocation of one’ voting rights when they are convicted of felony charges. It is a concept that excludes ex-felons from participating in the voting process temporarily or permanently. Voting rights can only be reinstated by a court order or direct executive order from the State Governor. The Supreme Court prevailed that, even though it was in support of the initiative, the Governor had disregarded significant factors that may have ramifications for the entire society. The court opinionated that mass re-enfranchisement portends a danger to the society given that it collectively empowers the undeserving as well as the deserving in the society without creating a distinction (Holloway, 2009). By the time the clemency order had been admitted for contestation in the Supreme Court, over 70,000 ex-felons had been re-enfranchised. The court argued that there was a need to follow legal channels in issuing a sensitive order lest it is misinterpreted. The law authorizing ex-felons to reclaim their voting rights in Virginia is a culmination of myriad collective efforts spanning decades. Calls for voting rights restoration in Virginia began in the nineteenth century. At the time, ex-felons were barred permanently from accessing voter rights. Advocates of the initiative prevailed that, to fully integrate into the society, ex-felons should be granted every freedom possible (Holloway, 2009). Alienation of ex-convicts would only inspire disillusionment, which in turn inspires a recurrence of criminal offenses. This stimulated the formation of a provision within the Virginian Constitution that empowered ex-felons to request to have their voter rights restored. Despite the development, only a few entities were allowed their voting rights. This is because the process was marred by several challenges and restrictions that curtailed the extension of the voting rights to ex-felons. Only a handful of ex-felons benefited from the legal initiative. The slow uptake of the legal framework led to calls for reinforcement of executive orders by the Governors empowering ex-felons to vote. One of the institutions that were at the forefront in calling for the use of executive order by the Governors was the Brennan Center. It reiterated these calls since 2005 when Governor of Virginia was Mark Warner. It further reinforced its requests through the governorship of Tim Kaine in 2009 (Brennan Center for Justice, 2016). Nonetheless, it was not until 2013 that calls for felony re-enfranchisement gained momentum. The prevailing Governor, Robert McDonnell, through an executive order, officially terminated the law that permanently disenfranchised ex-felons from voting. His efforts were pivotal given that they marked the evolution from the old legal framework to a new legal framework that would ease the allowance of voting rights to ex-convicts (Gibson, 2015). Under his guardianship, individuals who had completed their sentences for nonviolent crimes were inevitably eligible to vote. However, it was mandatory, under the McDonnell inspired framework, that each ex-convict should have a rights restoration certification before participating in the voting process. Upon ascension into Governorship, Governor Terry McAuliffe indicated that he would further extend efforts towards the streamlining of the efforts started by his predecessors. In addressing the issue, the governor began by broadening the category of individuals who would have their voting rights automatically restored upon completion of their sentences. Furthermore, he limited the amount of time that individuals who wished to apply for voter registration rights had to wait. Initially, the ex-felons were forced to wait for five years, but in his first term of office, McAuliffe curtailed the period to 3 years (Wise & Shelby, 2016). In June 2015, Governor McAuliffe rescinded the clause that imparted the responsibility of paying court fees to the applicants of the voter rights restoration. Before the initiative, voters were forced to service all the costs that were engaged in the voter rights registration processes (Brennan Center for Justice, 2016). In April 2016, Governor McAuliffe determined an executive order that addressed felony convicts. In the order, persons with felony convictions and had completed their sentences and parole period was allowed the right to vote. He further reinstated the order in May and June and allowed over 70,000 ex-felons to access voting rights. Subsequently, in August 2016, Governor McAuliffe provided an executive order that was in line with the demands of the court and did not breach the constitution (Ho, 2016). He, together with other stakeholders, determined a voting rights registration process that were not only efficient but mitigated the bureaucracies that were initially engaged in determining individuals who were eligible for the extension of the voting rights. Currently, the executive order comprises the legal framework, which is engaged in determining individuals who are to be extended voting rights. It further establishes a framework through which information is disseminated to the public on the issue of voting rights for ex-felons. The prevailing Virginia felon re-enfranchisement policies have several key components. To begin with, it is intended to empower ex-felons to be able to vote. The re-enfranchisement laws restore voting rights to individuals who will have finalized their sentences. It further allows for the restoration of votes to individuals who will have been released from a period of supervised release. The target comprises of individuals who are not on probation and parole. The law further began by restoring the voting right orders to those who had their voting rights revoked by the Supreme Court of Virginia. Likewise, under the revised executive order, the Secretary of the Commonwealth will be tasked with the duty of identifying individuals who are eligible for paroles (Brennan Center for Justice, 2016). The first target priority embraces individuals who had been released from prison for the longest time. After identification of the target group, the Secretary of Commonwealth will forward their names to the Governor on a rolling basis. The final release order lies with the Governor. The Governor will assess the names given to him and determine whether they should be affixed the rights or not depending on their behavior while in incarceration and the nature of the crime that led to their incarceration. The legal framework further allows individuals to apply directly to the Secretary’s office (Wise & Shelby, 2016). This option is available to individuals that may have been overlooked in the assessment phase by the Secretary of Congress. Individuals can apply through an online platform or by mail. The Secretary of Congress will take these requests into consideration and forward their names to the Governor who will review them and ratify them. After determination of the eligible names, the Secretary of Congress will announce the names, a process that is expected to be done on a monthly basis. There are several stakeholders who participated in the development of and are addressed the Virginia felony re-enfranchisement legal framework. The first group of stakeholders comprises governors and other Virginia State administrative officials. The development of the prevailing legal framework was a culmination of the efforts of four different governors in different eras of leadership. They include Governor Mark Warner, Governor Tim Kaine, Governor Robert McDonnell and the major player, Governor Terry McAuliffe (Brennan Center for Justice, 2016). The other stakeholders comprise ex-convicts and ex-felons. The law is intended to allow ex-convicts who have served their sentences to access an employ their rights to vote. The next stakeholder comprises the residents and political setting of Virginia. The ex-felon re-enfranchisement has an implication on the society of Virginia (Wise & Shelby, 2016). It significantly added the number of potential voters to the society. This may have an influence on the outcomes of elective processes within the State. The other stakeholders in the venture comprise the Virginia Supreme Court. The Supreme Court prevailed on the metrics to be engaged in the development of the felony re-enfranchisement laws. The Supreme Court was responsible for reviewing the initial executive order issued by the prevailing governor. The last group of stakeholders includes activists such as the Brenner Center (Brennan Center for Justice, 2016). These social agencies demanded and repeatedly advocated for the empowerment of the ex-felons by granting them all the freedom that applied to a man not in incarceration. The prevailing ex-felon re-enfranchisement initiative is a succinct response to their requests given that it allows members of the society to access all fundamental rights of a free individual. The law guarantees equal treatment of all Americans, which is pivotal in promoting equality. Black activist groups in Virginia further benefited from the initiative. Since the inception of the law, the felony re-enfranchisement executive order, issued by Governor Terry McAuliffe, has seen tremendous success. In the first executive order, prior to being challenged in court, 13000 individuals had their voting rights restored. Nonetheless, despite the court order, the whole of the 13,000 individuals were granted voting power through an executive order. The enforcement of the executive order as issued by Governor Terry McAuliffe further restored voting rights to over 200,000 individuals (Brennan Center for Justice, 2016). In essence, the order empowers an increasing number of Virginians to partake in the voting process. Despite the effectiveness of the executive order as determined by Governor McAuliffe, there is a myriad assertion against the initiative. To begin with, the challengers of the order prevail that it is a consequence of imagined racial problems. According to this faction, the felony re-enfranchisement initiative will only benefit the minority communities and curtail the application of justice. Nonetheless, these assertions overlook the reality on the ground. The majority of the individuals who are barred from voting are those from the black community. To reinforce democracy, it is necessary to protect the rights of all voters irrespective of their racial profiles. Likewise, opponents of the executive order prevail that it goes against the constitutional framework of Virginia (William J. Howell, et. al, Petitioners v. Terence R. McAuliffe, in his official capacity as Governor of Virginia, et. al., 2016). Nonetheless, in issuing the new executive order, Governor Terry McAuliffe publicly declared that it was under his mandate to issue such an order in his discretion. The Constitution of Virginia reinforces the need for democracy and protects the rights of all individuals regardless of their heritages. The felony re-enfranchisement initiative is an extension of the constitutional demands. Once people have served their sentences and regained their freedom, they should be extended every freedom possible to enhance their integration into the community. Alternatively, others question the aptitudes of ex-felons to make valid and efficient decisions. They prevail that committing a crime is a mark of mental instability. In voting, it is expected that an individual will have the capability to weigh options and determine a decision that is acceptable and morally upright. The proponents of this notion prevail that ex-convicts are barred from voting for the same reasons that children and the mentally ill are barred. Essentially, it is assumed that they are not able to make their decisions and may be motivated by unregulated desires in casting their votes, a factor that might hamper the electoral process. There are also individuals who reinforce that the automatic restoration of voting rights comprises a menace to the society. Based on these notions, ex-felons should only be granted voting rights after they have projected an ability and willingness to abide with the legal frameworks of Virginia (William J. Howell, et. al, Petitioners v. Terence R. McAuliffe, in his official capacity as Governor of Virginia, et. al., 2016). Automatic restoration would thus result in a blanket situation, which may target both the intended and the unintended. Essentially, restoration of voter rights should take a longer period. The respective authorities should be in a position to positively reinforce one’s willingness and ability to engage in community activities. Automatic restoration would curtail these initiatives. Despite the opposing viewpoints on felony disenfranchisement, I support the initiative in its current form. The executive order is still open to review and further addresses all the stakeholder concerns. The seeds of felony disenfranchisement were sown in the days of slavery. Legal frameworks were created to curtail the participation and successes of the black individual in the political scene. The effort towards mitigating the threat posed by the African American in Virginia led to the creation of laws that advocated for five-year minimum sentences for any black offenders (Gibson, 2015). These laws were to be enforced regardless of the nature of the crime. It is under these frameworks that the felony enfranchisement laws were created. The policy agenda led to a drop in the number of White individuals who were incarcerated. The prevailing governor in 1829, Governor Giles prevailed that the few number of White race arrests was an indication of the White race’s honor (Gibson, 2015). It was then decided that universal suffrage would negate the progress of the Virginia community. Therefore, the governor rationalized efforts to ensure that black ex-convicts were barred from voting. It further limited the participation of poor Whites from voting. Voting was thus a preserve of the rich and White in the society. Since then Virginia has made significant strides in the attainment of universal suffrage. However, before Governor McAuliffe’s order, the felony disenfranchisement laws in practice within Virginia had continued to reflect the racial premises that were involved in its creation (Gibson, 2015). Consequently, given that more than any other community, the blacks are to be found in the prisons, the laws negatively affect the black community. In an era of universal suffrage and enlightenment, it is necessary to engage metrics that promote democratic principles and fairness in the community. The executive order as issued by Governor Terry McAuliffe is a significant step towards the attainment of 21st Century suffrage. I further recommend that in the future revisions of the legal framework, the re-enfranchisement policy should be extended to all ex-convicts regardless of their crimes. When one is admitted back to the society, they should be able to enjoy all the rights that every other individual in the society enjoys. Virginia is currently operating under a legal framework that is aligned towards felony re-enfranchisement. The prevailing Virginia governor, Terry McAuliffe established this law through an executive order, and under the legal framework, ex-convicts would have their voting rights restored. The executive order has been the subject of lawsuits by opponents of the initiative who prevail that it hampers the succinct application of justice. Regardless, the law is essential given that it allows ex-convicts to integrate into the community fully. It further grants them the opportunity to determine their political environment. Gibson, H. A. (2015). Felons and the Right to Vote in Virginia. The Virginia Newsletter, 9, 1-9. Ho, D. E. (2016, July 19). Virginia needs to fix its racist voting laws. Holloway, P. (2009). ‘A Chicken-Stealer shall lose his vote’: Disenfranchisement for larceny in the South. Journal of Southern History, 75(4), 931-962. William J. Howell, et. al, Petitioners v. Terence R. McAuliffe, in his official capacity as Governor of Virginia, et. al., 160784 (The Supreme Court of Virginia June 27, 2016 ). Interest groups are voluntary associations that aim to influence public policy or promote a specific cause. Interest groups emphasize the importance of a particular factor in society of which they seek to create an advantage or protection for in order to yield the benefits. Interest groups advocate for an array of policies, from environmental policies to corporate policies to political policies. Interest groups conduct their duties on the basis of having common interests among a group of people (Baker and Losco 15). Economic interest groups nationwide attempt to influence economic policies within the country that has an impact on all the states. These interest groups represent big businesses and corporations and seek to create favorable economic climates for the profitability of their enterprises. Economic interest groups in California, however, seek to influence economic policies within the state of California without these policies necessarily having an impact in other states (Baker and Losco 18). These interest groups represent the largest companies and businesses based in California and seek to create favorable business terms for these corporations operating specifically within the state. Enos, Ryan D. and Fowler, Anthony. Pivotality and Turnout: Evidence from a Field Experiment in the Aftermath of a Tied Election. Political Science Research and Methods: 1–11, 2014. Gatrell, Jay D. and Bierly, Gregory D. Weather and Voter Turnout: Kentucky Primary and General Elections, 1990-2000. Southeastern Geographer 42 (1): 114–134, 2013. Present day companies and management bodies are aligned towards employee monitoring, and an increased number of companies take it upon themselves to establish activities that their employees engage in both within the institution and outside the institution. Employee monitoring is a process by which the management or employers of a given organization tracks the activities of the employees. The initiative is often intended to streamline the efforts of the employees to achieve the goals of the organization. It is further intended to prevent occurrences of theft and underachievement in the subject organizational structure. For individuals who work in a static setting, the management often employs different techniques in attempts to track the activities of their employees. However, the main form of monitoring engaged in such a situation entails supervision (Mello, 2012). In such a case, the employer picks one of the individuals who is tasked with the duty of compiling a report on the activities that were undertaken in the field. Likewise, the employer can choose to employ a car tracking or mobile phone tracking method to monitor the movement of their employees while away from the office setting. Despite the positive implications of employee monitoring in an organizational setting, it is subject to a myriad ethical and legal issues. Firstly, it constitutes a breach of employee privacy. When one is monitored without the knowledge that they are being monitored, it constitutes an illegal act. Despite the fact that most employers indicate that the initiative is strictly work related, they may collect private and personal information in the process of recording (Mello, 2012). Such unauthorized intrusion into personal life makes employees despise the management and affects their morale. Furthermore, it is necessary that the employees should be informed of the ways by which the information collected is to be used (Yerby, 2013). They should be aware of the implications of the initiative before it is instituted. Alternatively, constant monitoring comprises a tool of stress. It inspires unnecessary pressures on the employees who in turn suffer stress related ailments. Furthermore, most employers use the monitoring tools to promote and further the progress of individuals in the office setting. It is possible that the recorded individual’s observation would affect a behavioral pattern that meets the demands of the monitoring party and hence gain an unfair advantage over other hardworking employees in the work setting. Business Ethics. 43(4), pp. 353-361. Big Brother? Labor Law Journal. 63(3). Knowledge Management. 1(2), pp. 44-55. Learning is one of the most crucial human engagements. It is the essence of education, although much of human learning occurs outside the school system. For many years, psychologists and philosophers have attempted to understand the learning process, how it progresses, and how one party can influence the learning of another party through teaching. Consequently, a number of theories have been fronted in an effort to explain these processes. Some of the most common theories of learning include behaviorist, cognitive, and social theories. While these theories of learning largely look into the change in the knowledge of an individual and their ability to gain skills, there are still considerable differences regarding these changes. More importantly, it must be understood that there are different forms of learning which are better explained through various theories. The theories of learning, therefore, complement each other to offer different perspectives on the learning processes and situations. The cognitive theory assumes that learning is a process arising from biological maturation and environmental experience (Clapton & Cree, 2004). The theory argues that the manner in which the learner thinks affects their behavior and therefore underscores the importance of thinking. Cognitive development is the process of increasing the intellectual capability of an individual (Clapton & Cree, 2004). Learning in this regard is about the ability of the learner to acquire new knowledge and process it. The acquisition of knowledge involves internal codification mechanisms in the mind of the student. Both the environmental and the mode of instruction are vital to the cognitive development of the learner. Learning through cognition is aimed at coding, rehearsing, storing, and retrieving information (Clapton & Cree, 2004). The information defines the learner’s beliefs, thoughts, values, and attitudes. Memory plays a significant role in the learning process since information is stored in an organized format in the mind. Teachers should, therefore, use techniques like analogies to help the students in memory. In cognitive learning, knowledge transfer occurs when the learner understands how to apply the knowledge within a different context. Therefore, while the knowledge stored in the mind is important, the ability to implement that knowledge is equally important as part of the learning process. Jean Piaget opined that intellectual growth of an individual occurs through the processes of assimilation, accommodation, and equilibration (Good & Schubert, 2001). 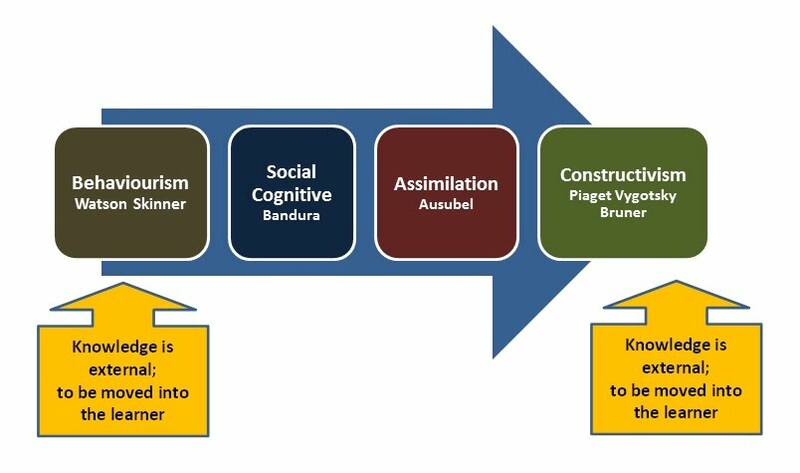 Assimilation involves using existing knowledge to deal with a new situation while accommodation includes changing the existing knowledge to deal with an emerging situation. Equilibration occurs when the learner can comfortably deal with new knowledge. In conclusion, it is seen that the learning process in humans is a component of a different mechanism. The theories of learning all attempt to provide an insight into how people gain knowledge, store its, retrieve it, and apply it to solve issues encountered in life. The theories work in tandem since no single theory can adequately explain all the realms of the human learning process. Additionally, in a typical learning environment such as a school, learning occurs through various ways which complement each other. The role of the environment in the learning process cannot be overemphasized. Clapton, G. & Cree, V. (2004). Learning for effective and ethical practice: Integration of learning for practice. Edinburgh, Scotland: Scottish Institute for Excellence in Social Work Education. Good, D. M., & Schubert, C. R. (2001). Faculty practice: How it enhances teaching. Journal of Nursing Education, 40(9), 389-396. Gordon, M. (2009). Toward a pragmatic discourse of constructivism: Reflections on lessons from practice. Educational Studies, 45(1), 39-58. Wrenn, J. & Wrenn, B. (2009). Enhancing learning by integrating theory and practice. International Journal of Teaching and Learning in Higher Education, 21(2), 258-265.